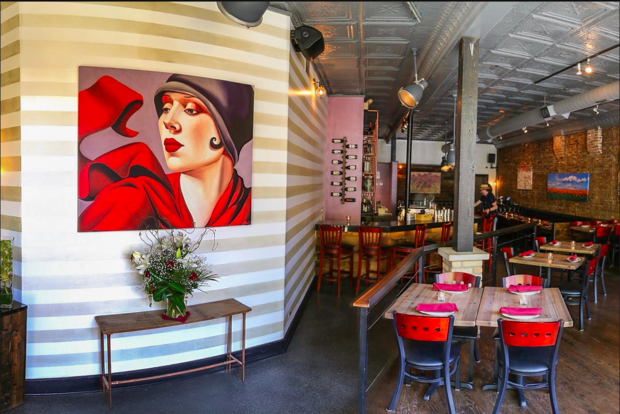 LAKEVIEW — Great news, Boystown: Your shared-plate bottomless brunches are back. Seven months after Taverna 750's short-lived move to Andersonville, its replacement at 750 W. Cornelia Ave. has breathed new life into the upscale casual eatery now known as Bistro 750. At the helm are two Kendall College buddies who worked at Taverna 750 but are now in full control of the restaurant's operations. "I've only ever worked in established businesses, so the creative aspect [there] is coming up with a special or a new marketing tactic," said general manager Sean West. "But here, we're starting from scratch and seeing what we can do." It's a fresh start for the quaint neighborhood spot, which began as an affordable upscale Italian restaurant in 2011 that replaced Cornelia's. 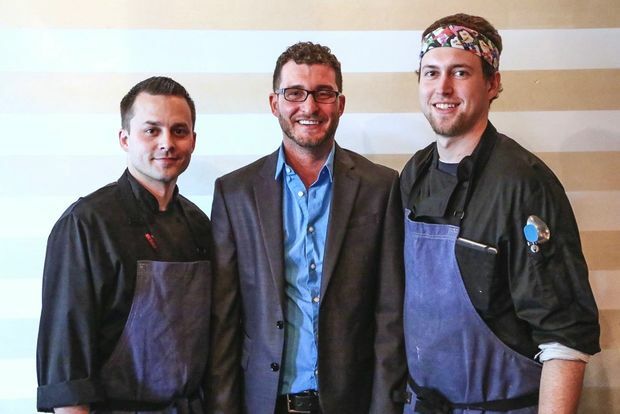 But in August, Taverna 750 moved abruptly, with owner Paul Cannella citing an "unexpected and unfortunate turn of events," which Eater Chicago classified as a landlord dispute. Cannella was stunned to see landlord Thomas Sherwood had filed a new liquor license application for the space amid lease negotiations, GoPride reported in July. While Taverna 750 moved to Andersonville, it lasted there about a month before closing in the former Brixton location. Cannella, who also owns Scarlet Bar in Boystown, told Eater he was unsure whether he would ever reopen Taverna. "I think we're still licking the wounds and not ready to make that determination yet," he said. Back in Boystown, Sherwood handed the reins to West and chef Michael Lanzerotte, who were eager for a chance to reinvent the restaurant after stints at Publican Quality Meats and Acadia. "My favorite piece is the amount of love we get from people in the neighborhood," West said. "They want us to succeed, even if that means telling us we need to change everything. That's everything I could wish for in a base of customers, just for them to care." Together, they redesigned the menu to offer a more refined selection of Mediterranean shared plates at "a neighborhood price." Around the corner from Little Jim's, Peet's Coffee and Hydrate, "there's not really a date night spot [nearby] where you can get more elevated food," Lanzerotte said. To fill the gap, "we offer food that's more common in areas like West Loop, but we're here, and our prices are much more affordable." 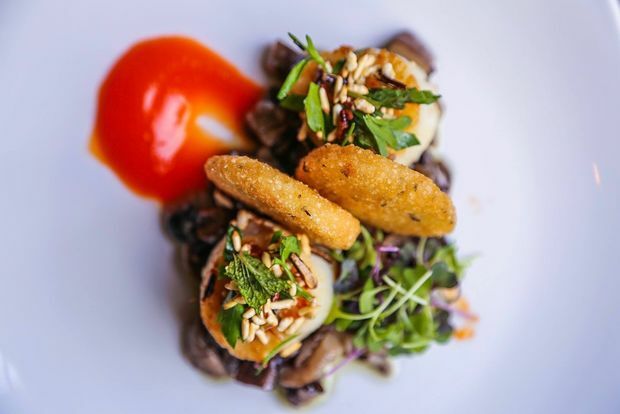 Scallops from Bistro 750 are served with a fermented red pepper sauce paired with a sticky rice fritter, pickled mushrooms and puffed wild rice. Bistro 750's menu will regularly change — in six weeks, they've tweaked it three times — to offer seasonal Italian and French-inspired dishes made with produce and raw ingredients from around the Midwest. The duo has already started to infuse the spring menu with summer ingredients like parsnips and miso-fermented mushrooms paired with fried calabrian chiles and peanuts ($9). Harkening to a sunny day at the ballpark is a duck bratwurst for $12, which is served sliced with caraway granola and a bourbon plum sauce. 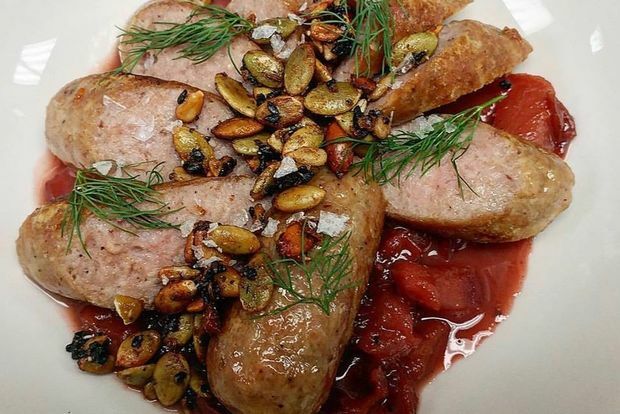 A fun twist on a summer staple, the duck bratwurst shared plate is made with a bourbon plum sauce, caraway granola and dill. Lanzerotte uses sunchokes — a nutty species of sunflower — four ways in one dish, poached in olive oil and fried and served with sunflower tahini sauce and sunflower seed crackers along with black currants and a spring onion emulsion ($12). One of his favorite dishes is the agnolotti, which are small ravioli filled with Indiana ameribella and pecorino cheese similar to a taleggio found in the Italian Alps. 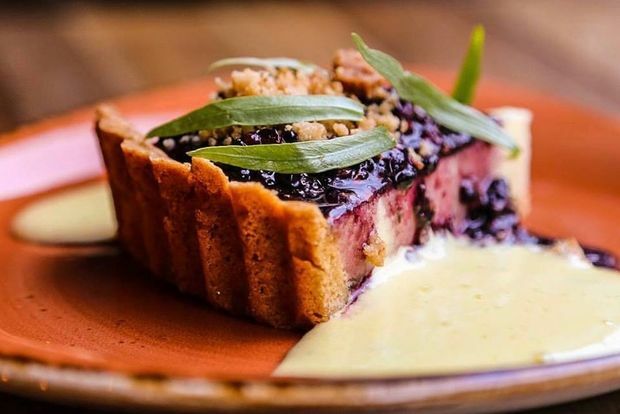 Bistro 750's rotating dessert menu includes a blackberry tart topped with pink peppercorn crumble, tarragon cream and limoncello sabayon. "We're making an Italian pasta dish, but using this awesome cheese from Indiana," Lanzerotte said. "Mediterranean is the focus, but we're using ingredients from around here that I really believe in." One major change from the Taverna days is expanding how many suppliers they use — adding more gives them a better selection of the best produce the season has to offer, which means more flexibility when it comes to designing dishes, Lanzerotte said. It also means everything — absolutely everything — is made from scratch. They cure their own bacon, brine their own corned beef (using tri tip instead of brisket) and toast their own hazelnuts to make the creamy Nutella waffles, topped with vanilla mascarpone and banana syrup ($8). 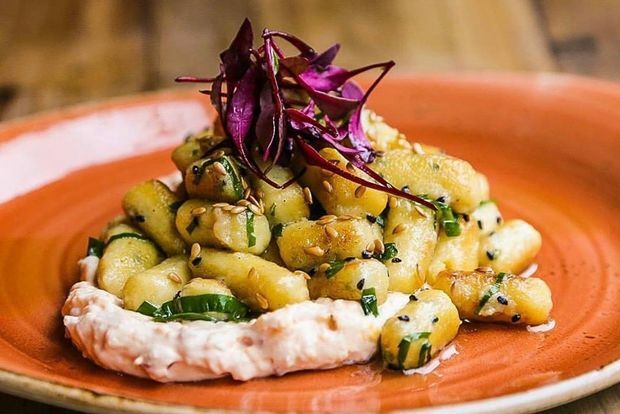 Bistro 750 chefs dream up weekend specials like this cheddar Parisian gnocchi, which rest on a thick fermented garlic sauce and come with pimento cheese and flax seeds. The waffles are part of a sturdy brunch menu, which is currently available on Sundays but will expand soon to Saturdays. Joining the Nutella waffles are a smoked pulled chicken thigh with red eye gravy and grits ($10), a salsa verde steak and eggs ($14) and a $10 pizzette topped with a spinach and pecorino bechamel sauce and roasted mushrooms. 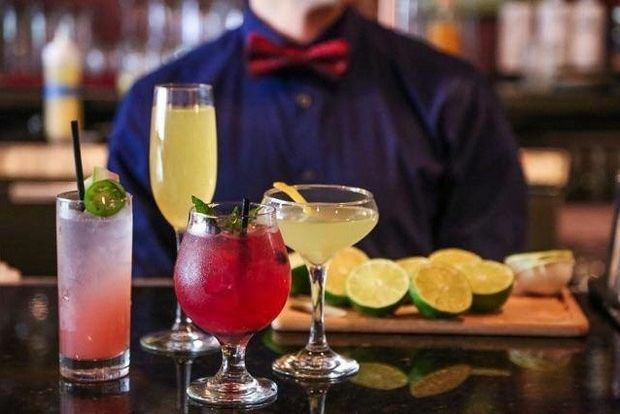 For those who like brunch boozy, a $15 add-on includes an appetizer and bottomless mimosas and bloody marys, with the ability to switch between the two during the two-hour window. The $10 cocktails are also half price with the brunch package, with the current summer list including blueberry vodka lemonade, a plum fantastic and a raspberry Tom Collins. Cocktails at Bistro 750 include a blushing mimosa made with pineapple juice and grenadine and a watermelon cooler. Bloody marys are made with the diner's choice of Glenmorangie single-malt scotch, Booths gin, CH vodka or Altos blanco tequila. Bistro 750 is open from 5:30 p.m. to 11 p.m. on weekdays and until midnight on Friday and Saturday. It opens for brunch on Sunday from 11 a.m. to 4 p.m., with dinner service from 5:30 to 10 p.m.